Since 1981, the National Industrial Fastener & Mill Supply Expo (NIFMSE) has brought together manufacturers and master distributors of fasteners, precision formed parts, fastener machinery & tooling with distributors and sales agents in the distribution chain. From industrial to construction, electronic to automotive and aerospace, NIFMSE is the trade show where all varieties of distributors come to expand knowledge, see customers, build new relationships, and find new products. Acquired by Emerald Expositions shortly after last year’s show, NIFMSE this year shaped up to be an amazing show. This year there were a variety of informative sessions and networking opportunities. We enjoyed seeing the creativity that went into creating this years exhibitor booths at the National Industrial Fastener & Mill Supply Expo. Exhibitor Booths are a chance for companies to introduce their team, display their products, strengthen customer relationships, and most certainly to write new orders! Exhibitor Booths must grab the attention of thousands of show attendees. 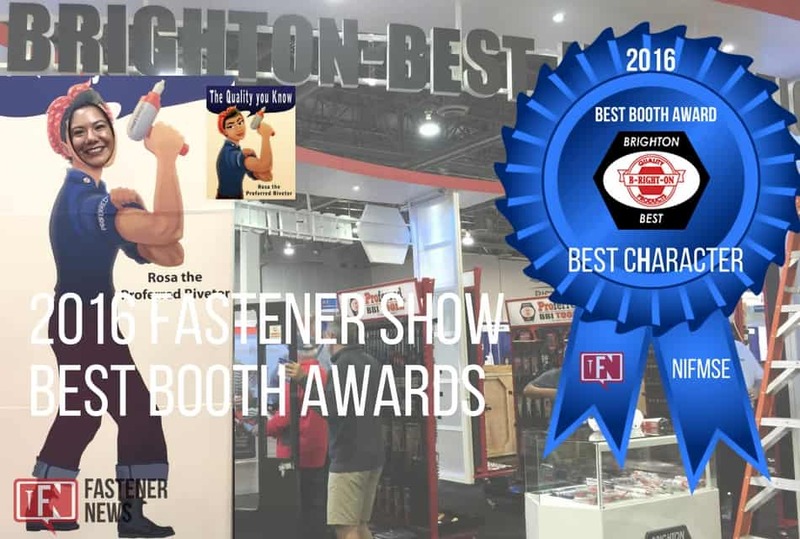 For the last two years, Fastener News Desk has been hosting the Best Booth Awards (2014 & 2015) at the National Industrial Fastener & Mill Supply Expo. 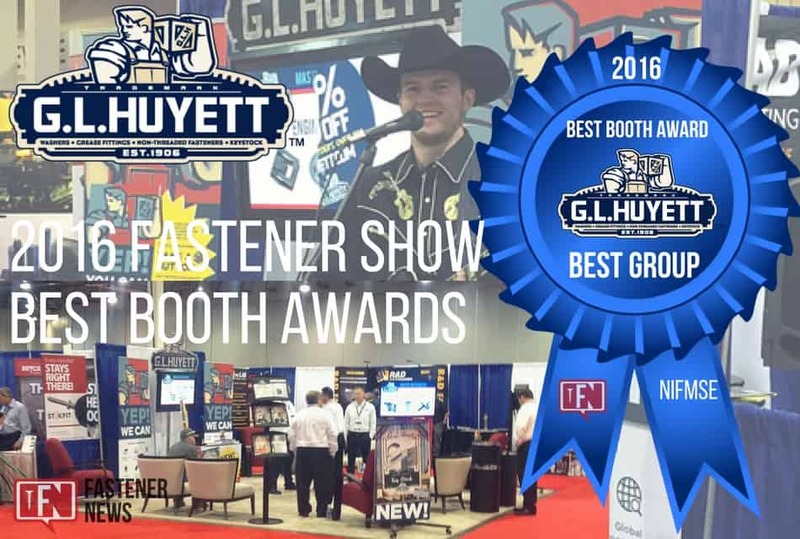 The Best Booth Awards have highlighted the most creative displays, booth representatives, and technologies showcased on the show floor. 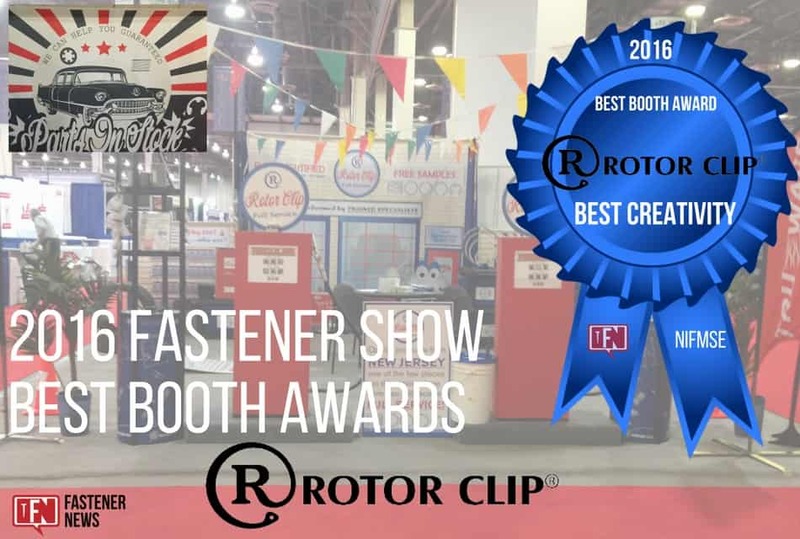 For the third year in a row Fastener News Desk attended the National Industrial Fastener & Mill Supply Expo in Las Vegas, Nevada where we scoped the floor for the most outstanding booths present at the show. Here are this year’s categories and winners for the NIFMSE Best Booth Awards! our 2016 Overall Best Booth winner is! Since 1983, Lindstrom has been providing distributors with value-added fastener solutions they can depend on — all from a name they can trust. With over 180,000 SKUs, Lindstrom can supply any size, quantity, or finish — even hard-to-find fasteners. Lindstrom can provide it all. Lindstrom’s booth was so eye-catching, it took our breath away when we first walked into the venue. The size was incredible! The overall design of the booth was very high-tech. The design spoke to all the core values of Lindstrom and their products. 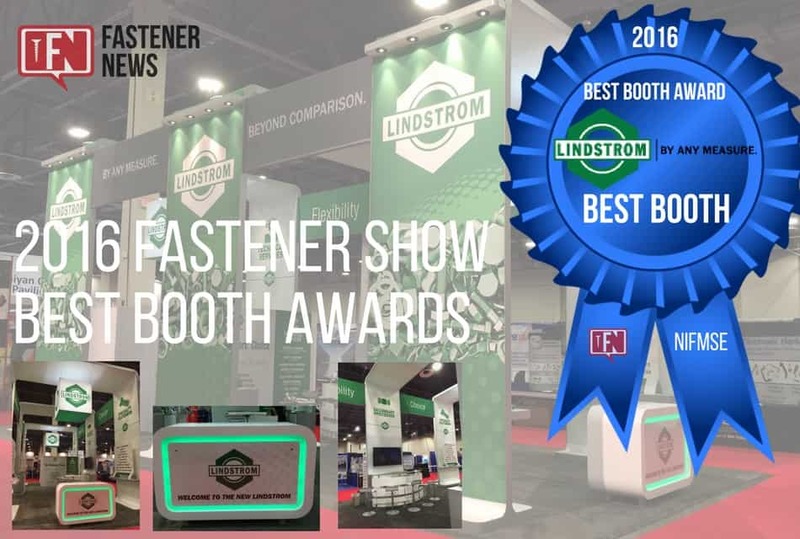 The professional booth design was unique and highlighted the green and white corporate colors of the Lindstrom brand. The booth was bright and inviting to passersby. 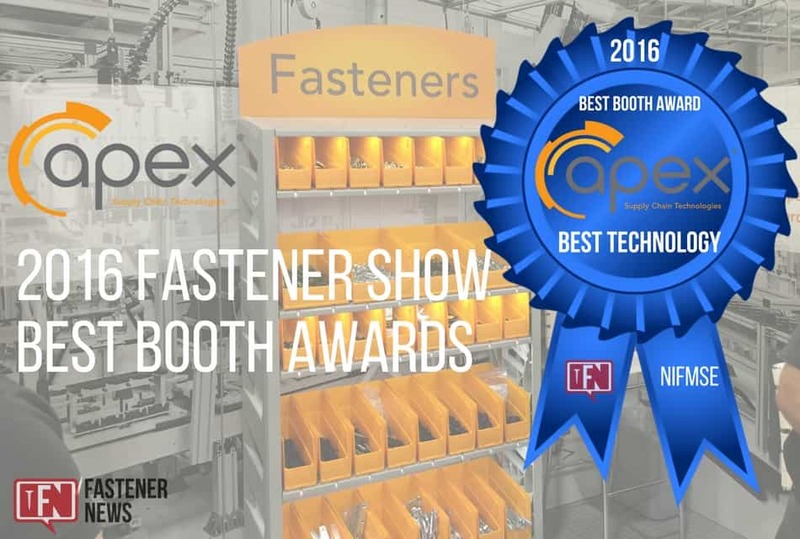 Having gone (literally) above and beyond, we award the Fastener News Desk: 2016 NIFMSE Best Booth Award to Lindstrom Fasteners. The largest supplier of wholesale fasteners in North America servicing distribution since 1925. With 20 US locations and 31 locations globally, Brighton Best is the value-driven, global leader in fastener distribution providing fasteners to all aspects of industry including construction, electrical, industrial and OEM applications. Specialties include: Fasteners, Threaded Rod, Alloy and Stainless products, Inch & Metric products, Socket Products, Hex Cap Products, Nut & Washer Products, Structural Products, Screw Products, Bolt Products, Hand Tools. Our Best Character Award goes to Brighton Best International! It’s more like character(s). If you’re on social media, there’s a good chance you’ve crossed paths with ‘Rosa the Riveter’. This year, Brighton Best featured both Rosa the Riveter and ‘Proferred Pete’ at its booth. With fun cutouts, you had the chance to take a photo as Rosa or Pete. These characters were entertaining, cute, and clever which is why they are our choice for Best Character. G.L. Huyett seeks “To profitably exceed expectations using three principles: Be honest, work hard, and live by the Golden Rule. They have complete onsite manufacturing capabilities and they source parts from industry leaders and low cost producers as well as manufactures that are hard to make or just plain hard to find. [They] are especially competitive for short runs and odd configurations. Do you need hard to find parts in metric or imperial sizes? In stainless steel? Or in non-standard sizes from big to little? If so, [they’ve] got them, [they’ll] get them, or [they’ll] make them to your specifications. Our Best Group Award goes to G.L. Huyett! Our friends at G.L. Huyett are a great team. From their friendly disposition online to their friendly disposition at their booth on the floor, G.L. Huyett puts a smile on our faces and everyone they meet. Welcoming and kind, we applaud G.L Huyett for their warmth (and their backup singing). If you ever cross paths with a company representative, take the time to say “Hello,” it just might make your day as it makes ours. About Stelfast, Inc.: Stelfast Inc. is a leading importer; stocking master distributor of fasteners and specialty parts from Asia, Europe, and South America (from standard commercial items to special parts per print); and manufacturer of truck and specialty fasteners. With a knowledgeable and dedicated team of employees, Stelfast has expanded to ten regional distribution centers across North America. Stelfast is a family owned and operated company. [They] offer over 12,000 SKU’s of fastener products direct from stock, including many lines of bolts, cap screws, nuts, screws, and washers in variety of finishes. [They] offer per print, specials, and standards either direct from mill, cross dock, or stock and release. 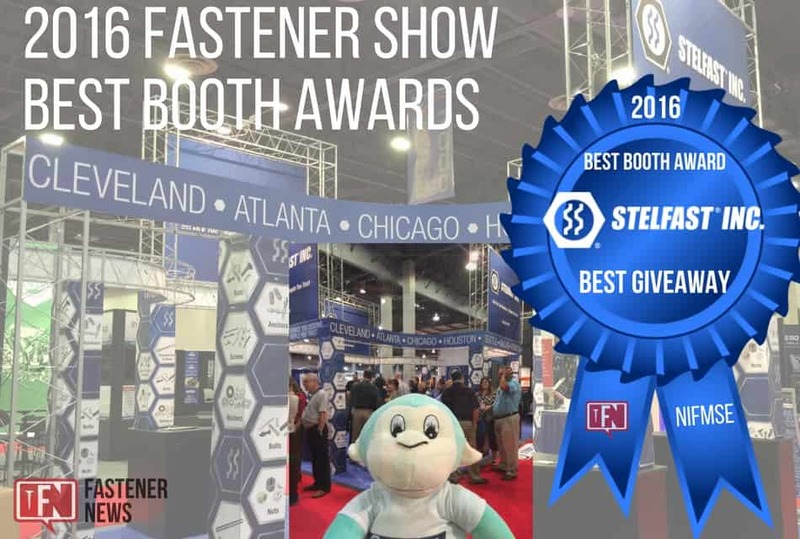 Our Best Giveaway Award goes to Stelfast, Inc.! The classic Stelfast, Inc. monkey was our selected giveaway. Everyone complimented them and they could be found across the show floor. We spoke with Dana McLaughlin of Stelfast, Inc. to learn what the secret was behind these adorable monkeys. She told us it started as a small joke within a family-business regarding the idea of “monkeying around.” Now, in their 12th year, these monkeys have come in different colors each year and have been taken around the world. Iconic and lovable, Stelfast, Inc.’s monkeys are a giveaway to go bananas over! Rotor Clip manufactures a full line of inch, DIN, ANSI metric and JIS retaining rings to world standards, as well as a complete line of constant section rings, spiral retaining rings, and wave springs. There are over 50 different styles and over 1000 part numbers to fit virtually every application. Rotor Clip supports its market with a full line of installation tools including applicators, pliers, dispensers and automated assembly equipment. The company intends to offer quality product and value-added services into the 21st century, and support the marketplace before and after the sale by providing technical assistance, product training, and cost-reduction programs, along with competitive pricing and JIT delivery. Our Best Creativity Award goes to Rotor Clip! Always impressive and unique, this year once again we couldn’t resist choosing Rotor Clip for the Most Creative Best Booth Award. Last year they had an outstanding supermarket theme which earned them overall Best Booth! This year was an intriguing automotive themed full-service station. Jürgen Wenzel of Rotor Clip, the mastermind behind the booth concepts, explained 2016’s concept as being more than just shipping, quality, or products. He wanted to highlight Rotor Clip as going above and beyond to serve offering certifications, tech support, contract pricing, and an overall customer experience. The booth was clever and radiated fun. Way to go, Rotor Clip! Smart Bins with Automated restock alerts keep VMI lines up & running Keeping your VMI bins full just got a lot easier, a lot faster and a lot smarter. Each ACTYLUS™ smart bin automatically detects low levels and instantly sends an alert to your ERP system, eliminating the need for counting trips and “milk runs”. That means no more safety stock, no more emergency orders, and more importantly, no more lines down. It’s the automated kanban, lean bin solution you’ve been waiting for. Our New Technology Award goes to Apex Supply Chain Technologies! We were very impressed with advanced technology product offering from the Actylus™ 8200! This new technology is where the Internet of Things (IoT) advances vendor management capabilities for the fastener industry. All the devices are easy-to-use Internet appliances (MS Windows-free). They’re powered by Apex Connect n’ Go™ Technology, so you simply plug the device into a power supply, connect to the Internet and you’re ready to go. The Apex automated point-of-use dispensing and supply chain technologies change the way business functions. Congratulations to all of the honorees and thank you to those who put their heart and soul into their booths! We are already anticipating the booths for 2017.